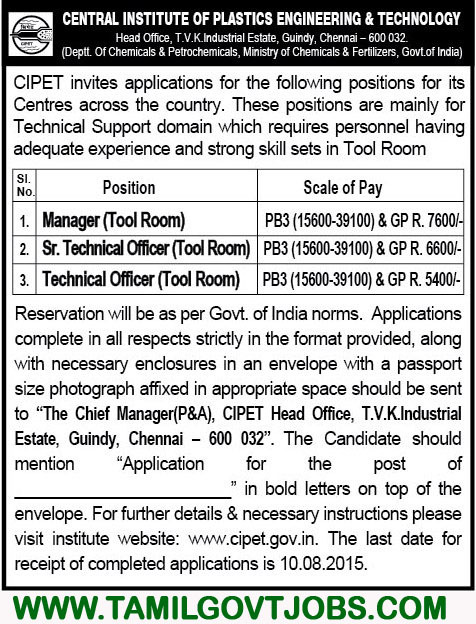 Applications are invited for Manager, Sr Technical Officer and Technical Officer in Tool Room Departments, CIPET. Manager (Tool Room) - Basic Pay 15600 Grade Pay 7600 in Pay Band III category - ME / MTech Mechanical Engineering with 8 years experience or PhD with 5 years experience - Age 40 years. Senior Technical Officer - Basic Pay 15600 Grade Pay 6600 in Pay Band III category - ME / MTech Mechanical Engineering with 5 years experience or PhD with 3 years experience - Age 35 years. Prescribed application form is available.